Interviewer: Welcome everyone! In today’s interview, we have two special witches with me today, one of whom you’re all horribly familiar with and another up-and-coming new sorceress! Please restrain your applause and welcome Edna, witch of the Haunted Woods, and Sophie, witch of Bogshot! …Okay! First question for the lovely ladies! Who do you think has the better name? Edna: I do of course; the shorter the better. Sophie: Please, your name reeks of age and dust, my name’s better. Edna: With age and dust comes great wisdom! I am an experienced witch who knows her advanced magic spells and potion-making, unlike you of course. Sophie: I’m allergic to dust. And if you admit to being that dusty and old, I’d be surprised if you denied the fact that you’ve forgotten some basic enchantments inside that cobweb-filled head of yours. Edna: For one who lives in a swamp, you’re one to talk. Sophie: And what’s wrong with Bogshot? Edna: It’s unsanitary. With you being young and ‘intelligent,’ people would think you’d be smart enough to move elsewhere. Edna: Now listen here! I’m not back in my 240s where I can just mosey over to necessary ingredients for my magic and just get them! That’s why people do quests for me, so I can reward them accordingly for their hard work and dedication! Sophie: You know, I’ve asked many a Neopian, and the majority seems to agree that they only bother with your excruciating excursions for a “Something has Happened” event box to appear over their heads signifying their obtainment of your horrible avatar. Edna: That’s a neat shot of me in my avatar, that is…Hey at least people would willingly flaunt my avatar rather than yours. 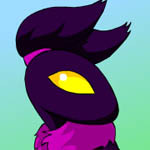 Sophie: I’m still threatening The Neopets Team to turn them into Bogberries if they don’t make my avatar harder to get. Besides, I heard that you don’t “reward people accordingly” enough depending on how much they spend on you. I heard you once gave a Slimesicle to someone who spent 5,000 Neopoints on you? Come on, Edna. Edna: Well, it’s not like I’m that ditsy Kayla where I can sell my potions to earn a sufficient living every day. Does she not realize how much neopoints she’s losing? Sophie: Sad to see talent like that wasted. It’s so – Hey! Stop trying to change the subject! Edna: The young are so easily fooled these days. Sophie: Only because the old waste their time thinking of ways to thwart the young’s daily lives. But with you bragging on and on about your advanced magical talents, why haven’t you created some potion which can alter your appearance to make yourself younger? Edna: I’m perfectly happy with how I look now. No need for magic there. Sophie: So you’re saying that you are proud of your wizened face and countless wrinkles? Edna: Well for starters, you didn’t have to put it that way…and why must you be so cruel to an old woman? Sophie: Aren’t witches supposed to be evil? Sophie: And if you’re a supposed witch, shouldn’t you be able to retaliate with a snide remark of your own? Sophie: Are you getting too old for this, Edna? Ashamed of what you are now?! Sophie: Do you even use your broom? Sophie: Besides sweeping your dusty, haha, dusty…I mean besides sweeping your dusty floor with it, when was the last time you actually rode on it? I doubt you remember how to even ride it. Sophie: Edna, are you alright? Sophie: Edna…I’m…sorry. I never realized how hard it must be for you…I honestly didn’t know, I’m truly sorry. There there, you know I didn’t mean all of the things I said. Edna: Well, now you know…I don’t know why we started arguing at all. Believe it or not, we have a lot in common…I’ve read about you and your nefarious deeds. You’re an inspiration to young witches all over Neopia, except Kayla of course. Sophie: That means so much to me, thank you. You know, this whole “meeting for the first time” thing didn’t exactly work out at the beginning. D’you mind if we share a cup of Festering Coffee and start over? Edna: That would be great, I’d love to learn more about your life in Bogshot; getting a bit tired of the Haunted Woods, you know. Sophie: No problem! I’ve never actually been inside your tower, would you in turn grace me with that privilege? Edna: Will do. I sincerely hope this’ll work out for the best. You’ll be the first friend that I’ll have the honor of knowing. Interviewer: Well that was extremely touching…even brought a tear to my eye…Let’s give a witchy round of applause to Edna and Sophie for being able to share this wonderful experience with us! Interviewer: Thank you both for your time; until next time, everyone!